We're pretty loosey goosey around here when it comes down to rules. 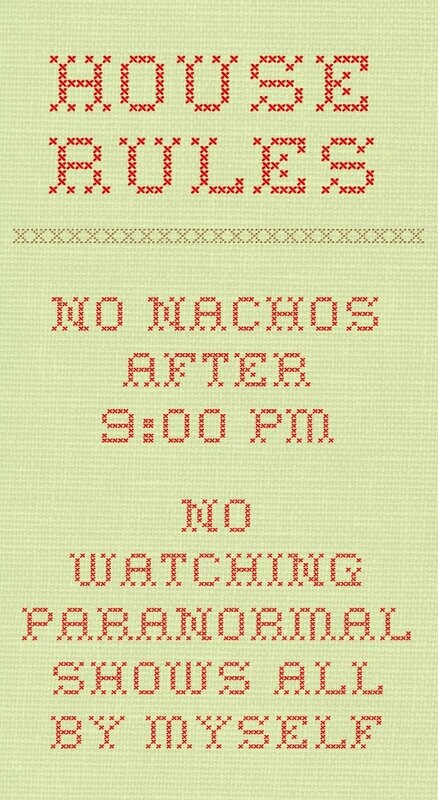 We abide by the Nacho Rule and that's about it. Why? Because you can't wake up feeling light on your feet after a late night nacho face stuffing (should all that be hyphenated?) has taken place. It's time for a second rule to be added. 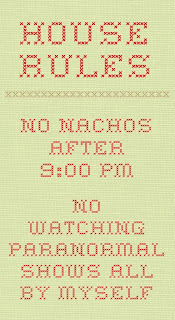 From here on out I may not watch any type of paranormal activity show when I'm all by myself, be it day or night. No good can come from doing either. Trust me. did you feel you had a paranormal sighting? Those shows always get my mind working overtime about it though! In the late 80's there was a lot of talk, shows, books, movies about aliens. I was scared $h!tless when I watched them...and my mind went wild. I'm older and much better about that stuff now. I'd take an alien any day over a ghost. That's what scares me!